When trying to become a better guitarist, there are a numberous things that can ruin your development. One of these is the problem that often happens when trying to grow in your guitar playing from bedroom guitarist to playing more interactively with others. You’ve worked so hard to play blues guitar and you finally feel that you’re ready to give a little gig for your friends or parents. But then, all of a sudden, when you start practicing standing up, you are having problems with the riffs and chords you’ve learnt. Besides that, your neck, shoulder and spine hurts. You can’t even curl your fingers and wrist to reach the right notes. You probably start thinking: what in the world is happening? As always, it is best to prevent, so make sure you read the following tips in order to avoid (or cure if you are currently experiencing) these problems. When you have mostly played the guitar while sitting down, your whole body is used to this position. The way you hold the guitar is programmed in your mind and your muscles. This so-called 'muscle memory' recognizes this sitting form for playing the guitar. The reason why you have trouble playing while standing up is simply because you’re not used to it. Your body mechanics to play the guitar while standing up are very different from the body mechanics while sitting down. Your wrist is turned in a different angle, your fretting hand has to reach further, your strumming hand has to reach further as well, and so on. All these things contribute in having trouble when playing with a strap. You have to enlarge your muscle memory in order to play equally as good standing up as sitting down. How you practice the transition from sitting down to standing up is hugely important for your development. 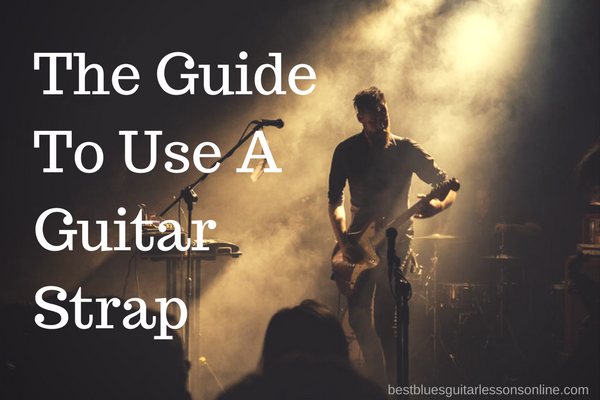 So let's explore what the most efficient way is to practice playing with a guitar strap. I defined how to practice guitar the right way in one of my previous free blues guitar articles. If your practice sessions are structured such as described in that article, we can now use the following method to learn how to play the guitar while standing up. We can divide the learning process to play guitar in standing position in four main categories. STEP 1 - The first one is the one you’re already doing. That’s practicing your guitar while sitting down in neutral position. In this position the guitar is balanced on your right leg. 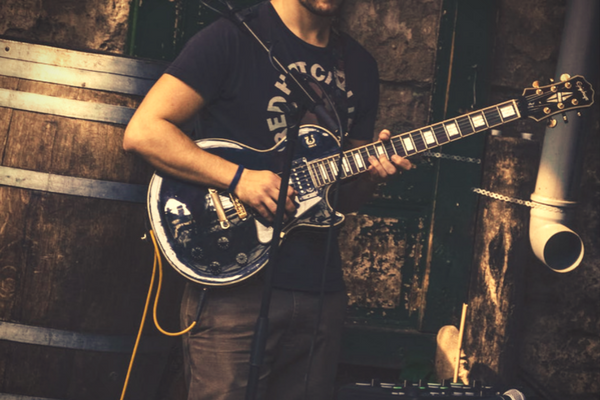 Make sure you have your blues licks, chords, songs, blues solos or anything you intend to learn correct so you can play it multiple times in a row without making a mistake. When the pieces you are learning are programmed in your muscle memory, you can continue to the next step in the progress to reach the goal of playing it while standing up. STEP 2 - In step two we change the way you hold the guitar to the ‘classical’ sitting position. The bottom of the guitar now rests on the inner left thigh and the back of the guitar body on the inner right thigh. This posture is far more similar to the standing position because you now have to reach further with your fretting hand. Repeat the musical pieces you intend to learn for standing up with the same approach as you do while holding the guitar in neutral position. This means you practice a piece the way I described in my guide for practicing the guitar the right way. But this time you hold the guitar in the classical sitting position. Once you are comfortable playing in this new physical situation, and you don’t make mistakes at least a few times in a row, you can continue to step three. STEP 3 - This third step is the part where you will stand up for the first time to practice your blues guitar playing. Start with the guitar strap hanging on your guitar where it corresponds to the position you use when you’re sitting down. When it comes to your image, this may look really high but if you are comfortable playing this way you can leave it like this and skip step four. Take a look at Tom Morello, he’s the perfect example that this position for a guitar is insane cool. If you’re more a ‘Slash’ type of guitar player who would love to hold the guitar lower, you can strap your guitar bit by bit down to finally end up in a not-to-low or not-to-high position. STEP 4 - Every time you’re comfortable and can play without mistakes, you strap your guitar a bit lower. It is however very important that the wrist of your fretting hand is not strained too much from the angle of the wrist so don’t go to low. Your body posture should remain upright at any time, otherwise things will get more difficult because your muscles will be more tensed then they need to be. When you learn something on guitar and you consider playing this live (even for friends or family), always work through with this strategy for playing standing up. What Type Of Strap Do You Need For Maximal Performance? Some guitarist prefer a flexible strap made from nylon, others like a more stiff and thick strap such as one out of leather. When it comes to what strap you should use, it’s mostly up to personal preference, but I do have a few tips you can keep in mind while searching for a strap that fits you as a guitar player. There are many different kinds of guitars, so their weight will be different too. If you play with a guitar that’s quite heavy, such as a Les Paul or an American standard tele, you might consider a wide strap. This way the weight of the guitar will be distributed more across the shoulder and it takes away a lot of the pressure on your spine. If you still have some trouble with the stress on your neck and shoulder, there’s also a type of strap called ‘comfort straps’. These straps are a bit more expensive but have built-in cushions to give you even more luxury while playing the guitar in standing position. When you are playing live it’s possible that you accidentally step on the guitar cable and by this pull the cable out of your guitar. Of course this would make the performance lose all energy and must be avoided at all costs. The way you can avoid this is pretty basic; instead of putting the cable right in the guitar before you start the performance, you put the cable underneath the strap and then stuck it in the guitar. When you’re now playing a blues solo live and you maybe go a little wild, it’s not dramatic anymore if you step on the cable because it’s stuck behind the strap so it won’t pull the cable out of the guitar. This tip is crucial for playing live so be sure you don’t forget it when you prepare for a live performance. Want to put your live performance to a higher level of intensity? Make sure you read my guide on how to play the guitar with intense emotions. If you are struggling to take your blues solos to the next level, I can guide you through your road to become the blues guitar player you’ve always wanted with my essential blues guitar soloing lesson.